This kit makes it easy to attach large inflatable balloons to any windows, including those of vehicles in your dealership, to attract more attention. Our exclusive dealership balloon kit is helium free and reusable over and over. Make your lot POP! The Reusable Balloon Window Kit can be used with any of our reusable inflatable balloons in your dealership. If you want to put up some colorful balloons in your dealership but you don’t have much space to put them, use this Dealership Balloon Kit to attach them directly to your vehicles windows. With this kit, you can quickly attach colorful balloons to all the vehicles in your dealership in a matter of minutes. The pole attaches to the window securely and tightly but without leaving any marks so you don’t have to worry about causing damage to your vehicles. 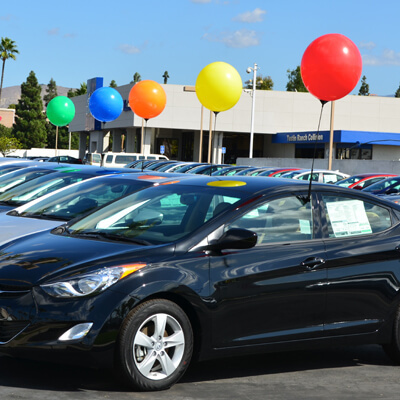 It allows you to attach balloons to all of your vehicles to make them all stand out instantly and get more attention from customers. Reusable balloons are a fantastic way to make your dealership look more enticing, and the Reusable Balloon Window Kit is the easiest way to attach them to your cars. In addition to this dealership balloon kit, we have a huge range of balloons and related products that you can look at today. See our Balloon Replacement Packs to top up on more balloons, or take a look at our Balloon Holder Kit, Reusable Cluster Kit, and Reusable Balloon Single Kit. We also have a Quick Flow Deluxe Balloon Inflator that makes blowing up the balloons easy. We’ll get your order to you in between 1 and 5 days after you make your purchase so you never have to wait around.